Subtractive synthesizer with soaring leads and powerful sound sculpting. One of the leading manufacturers of performance synthesizers has just improved their line even further. The Nord Lead 4 is a subtractive synthesizer with 2 oscillators per voice that incorporates innovative performance features, advanced layering and synchronization possibilities, new filter types and incredible on-board effects, making this a synthesizer dream come true. Hard Sync generates an irregularly shaped waveform resulting in a harsh, dirty effect rich with harmonics, first made famous by the Prophet 5. Soft Sync is a bit smoother, but by no means subtle. The Nord Lead 4 also features Frequency Modulator capabilities for adding spectral complexity and occasionally, nastiness. Two great new additions are the stunning emulations of the diode and transistor ladder filters from the legendary Mini and the TB-303 synthesizers. The emulations capture the dirty, squeaky resonance of the originals and combined with the new unison mode you'll have plenty of opportunities for making fat, squelchy basses and leads. The overdrive is modelled after a vintage tube amp. Make your lead sound a little "furry" or crank it up for a truly authentic overdrive that distorts increasingly the more signal you shove through it. The Crush effect lets you reduce the sound's sample rate radically. Give your bass line a subtle lo-fi touch or pulverize it into crackling, digital stardust. The compressor effect offers Threshold adjustment and can also be modulated to obtain side-chain effects and more. The Crush, Talk, Comb filter, Compressor and Drive effects can all be manipulated with the Morphs and Impulse Morph performance controls as well as with the LFO or the Modulation Envelope. The Delay effect has 3 feedback levels, a Dry/Wet control and the Delay tempo can be synchronized to the Master Clock. The Delay features an optional analog mode that behaves like an old school delay when changing the delay tempo on the fly. A great sounding Reverb effect is available when not using the Delay, with dry/wet controls, 3 reverb types and a brightness control for rolling off the treble when desired. The Impulse buttons are extremely powerful and let you alter your sound instantaneously - brilliant for creating spontaneous, synchronized rhythmic and tonal mayhem. Doubling the LFO rate, changing the oscillator from Saw to Square, enabling Glide, cranking up the resonance and muting the Reverb - all at once - for 2 seconds in the middle of your lead solo is now as easy as 1-2-3. Doing wobbly bass lines and complex choppy pads live, in perfect sync is a breeze! Impulse Morphs are a simple, yet universal concept that offers almost limitless flexibility. Assigning an Impulse Morph is simple - just hold down an Impulse Morph button and turn the desired knob(s) to the desired new value! Nearly every parameter can be controlled with an Impulse Morph and LED-lights indicate which parameters have been altered. By pressing different combinations of the 3 Impulse Morph buttons up to 7 unique combinations are available, per slot. The Morph is a classic Nord feature that lets you control any "knob-type" parameters with the modulation wheel, control pedal or velocity. The possibilities are endless - like changing arpeggiator range or adjusting the sample rate reducting Crush effect with the modulation wheel. 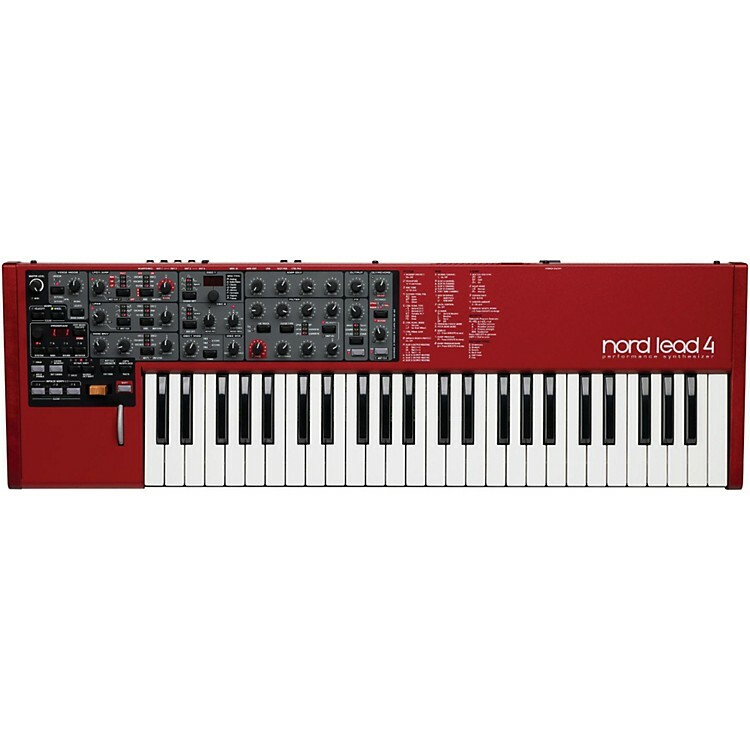 The Nord Lead 4 includes a classic Arpeggiator with Up/Down and Random modes and a 4-octave range. The Arpeggiator can be synced to the LFO and Delay using the Master Clock. A new Poly mode pulses all the notes you're holding as a chord instead of cycling through the individual notes, great for choppy chord stabs when combined with the new Patterns and Impulse Morph buttons. Having four slots means you can have 4 Arpeggios running at the same time! Take the lead with this great synth. 3 character LED display, 29 knobs and 20+ buttons for program and performance editing. OSC 1 generating sine, triangle, sawtooth, fixed and modulateable pulse waveforms and 128 wavetables. OSC 2 generating triangle, sawtooth or fixed and modulateable pulse waveforms or noise. OSC MOD section with Hard- and Soft sync plus 3 different Frequency Modulations of OSC 1 from OSC 2. Multi-mode filter with 12 dB (2-pole) low pass, 24 dB (4-pole) and 48 dB (6 pole) low pass, band pass, high pass, Ladder M and Ladder 303 characteristics. Filter keyboard tracking can be set to off, 1/3, 2/3 or 1/1. ADSR envelope, velocity control on/off, gain control. LFO 1 generates a square, triangle or any of 4 different types of saw- and inverted sawtooth waveforms. LFO 1 can be routed to Filter Frequency, Osc Mod, Osc Mix, Osc 2 Pitch, Amplitude and FX section. The modulation amount can be set as positive or negative/inverted. The LFO 1 rate can be synchronized to the Master Clock. The LFO 1 section is used to control the rate, range and directions for the arpeggiator. Arpeggiator: Range: 1 - 4 octave. Modes: up, down, up/down, random, Poly. The Arpeggio rate can be synchronized to the Master Clock. LFO 2 generates a square, a regular and inverted sawtooth, LF filtered noise and random staircase waveforms. LFO 2 can be routed to Filter Frequency, Osc Mod, Osc 1 and/or Osc 2 Pitch, Pan and Pulse width. The modulation amount can be set as positive or negative/inverted. The LFO 2 rate can be synchronized to the Master Clock. Modulation Envelope (Attack, Decay/Release) for Osc Mix, Osc Mod, Osc 1 and/or 2 Pitch, FX section and LFO 2 amount. The modulation amount can be set as positive or negative/inverted. The Modulation Envelope can be manually triggered by the Impulse Morph buttons. Patterns: the cyclic waveforms of the LFOs can be replaced by a pattern behavior. There are 128 different patterns, grouped in 6 different styles. Four program slots for layering possibilities. FX section with continuous Drive/Modulation control. Crush, Drive, 2 different Talk effects, Compressor and Comb Filter. Selectable Delay or Reverb. Delay times at up to 1400 ms can be manually set or synchronized to the Master Clock. Reverb has three algorithms, Room, Stage and Hall with adjustable brightness.